Question 8. What are the relevant target concepts for the learner? 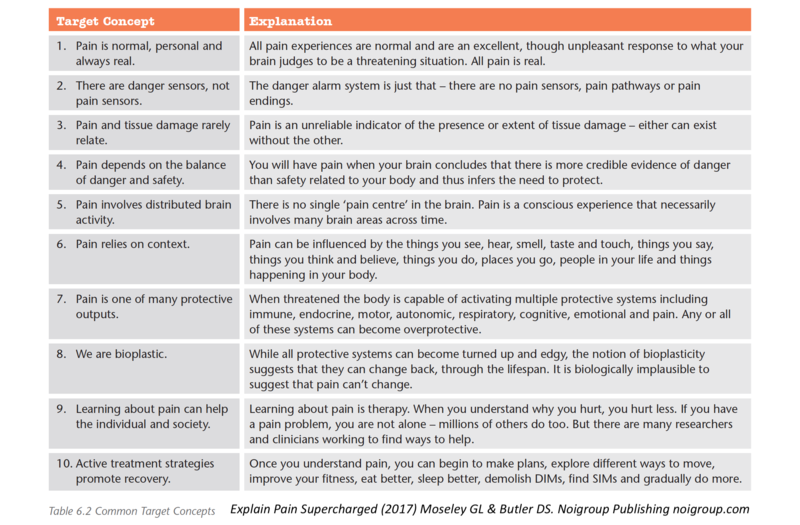 And here it is, the final instalment in The Explain Pain Assessment: Eight Great Questions*. This final question is about weaving the various threads, teased out via the previous seven questions, into a cohesive, integrated and tailored package of education for that individual. Thinking about target concepts has a number of different facets –which target concepts, what content will I include, how will I deliver them? How many, how long do I spend on each? How can I incorporate multimedia, narrative and metaphor? When do I deliver each target concept – over how many sessions? Here’s another bonus educational tip – in answering these which, what, when, how type questions you are actually building a curriculum – a whole topic in itself for a future series. Group settings will lend themselves to predetermined target concepts and you may choose to cover all 10 of the above, but even acute settings can benefit from a few target concepts delivered in the form of quick ‘neuroscience nuggets’. Or you might pick up on a few ‘E Flags’ at a review that you think need discussion (nuggets? E Flags? What? Don’t worry, in coming weeks we’ll explain these and provide some neuroscience nuggets linked with these target concepts to get you going). Educational interventions need to be dynamic and nimble – target concepts can be written down, but they should never be set in stone. What are your key target concepts? Share, discuss and comment below. What kinds of misconceptions does the learner hold? Not bad and worth reading until #10 Im sorry but no amount of weight loss, fitness, knowledge of pain is going to remove the knife in my knee. I was going to say back but thought you would not agree so Ill go with the bone on bone in my left knee. :-( Ill leave the other injuries out of it. Incorrect. Pain is never just mechanical, so even if it is bone on bone (which it is not if you can still move your knee) reducing the chemical cause will decrease your knee pain. This has been my experience clinically. Those are definitely my top 10 target concepts for explanation and discussion! For those whose pain experience started with a distinct INJURY, I also have a target concept that “at SOME point after an injury (depending on which tissue(s) were damaged), ‘active healing’ stops”. That is, we may be left with a weak/tight/’boggy soggy’ tissue, but the process of inflammation/healing that begins straight after the damage occurred does not go on indefinitely. If we keep protecting or poorly loading these unhealthy tissues, they get stuck in their state of un-healthiness – something has to change to make those tissues strong/healthy/resilient again. A brain that receives a stimulus of repetitive, graded, healthy movement and learns that the previously damaged tissue can actually move and load bear, has less reason to feel in danger when that part of the body is stimulated. And therefore, is likely to lessen its pain response when that area is moved/loaded/stimulated/thought of. I modify this message for people with identified (permanent) pathology. I still like to get across the idea that even permanently pathological tissues will be better looked after if they and their neighboring tissues are kept healthy with respectful movement and sensible loading. A brain that gets used to healthy movement in an area where there is pathology, is less likely to feel threatened by movement or loading in that area, especially when it “knows” that this amount of movement or loading is SAFE for that … (insert diagnosis). You are alluding to one of the most common target concept variations and that is adding a new one . In some people or groups I may add a target concept around the lines of “the true story of OA” (or other disease state) and this would require information on tissue healing as you have presented above.